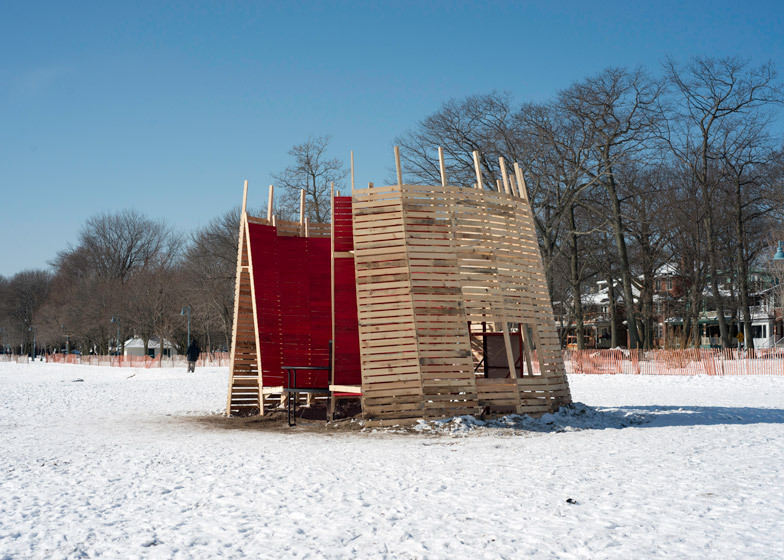 Lifeguard outposts along Toronto's frozen waterfront have been converted into a series of installations and pavilions, including a set of bright red swings and a spiky timber folly (+ slideshow). 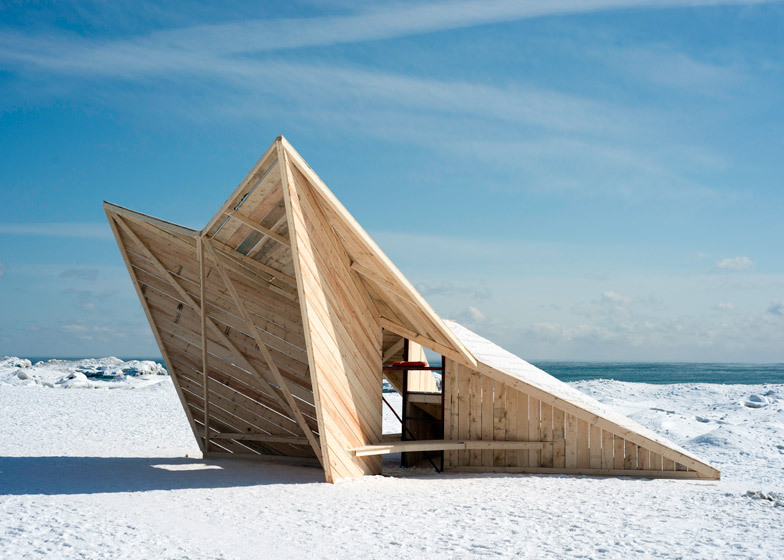 Winter Stations is the first instalment of an annual public art competition launched by a trio of local studios – RAW, Ferris + Associates and Curio – to revitalise Toronto's frozen beaches during the cold season. 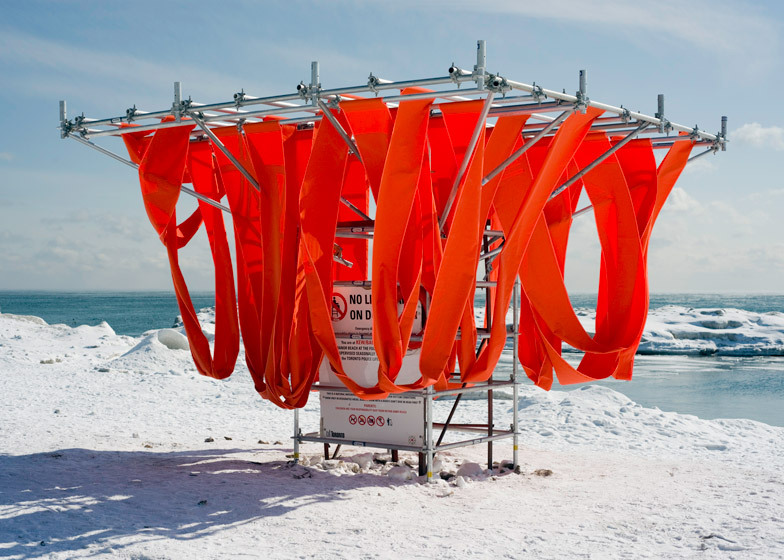 Taking the theme of warmth, five teams were invited to convert a series of simple metal lifeguard lookouts along Kew-Balmy Beach on the edge of Lake Ontario into installations for winter. 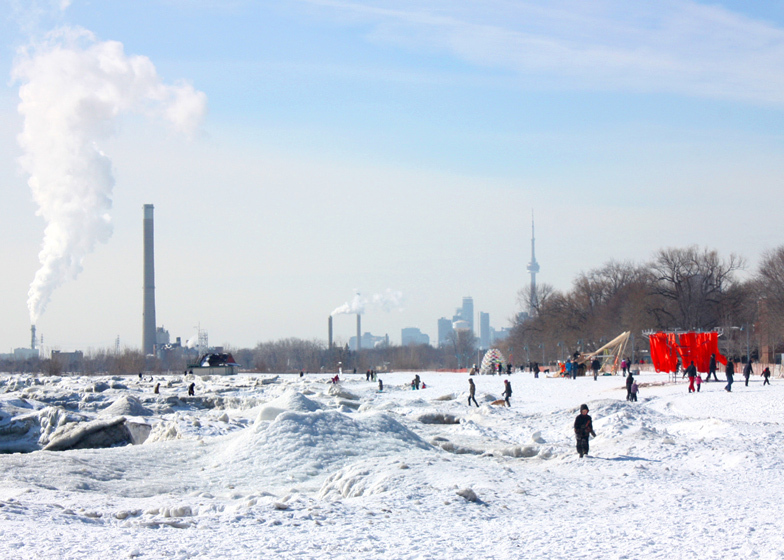 "Sometimes Torontonians need to be prodded into heading outdoors during the winter months," said the organisers. 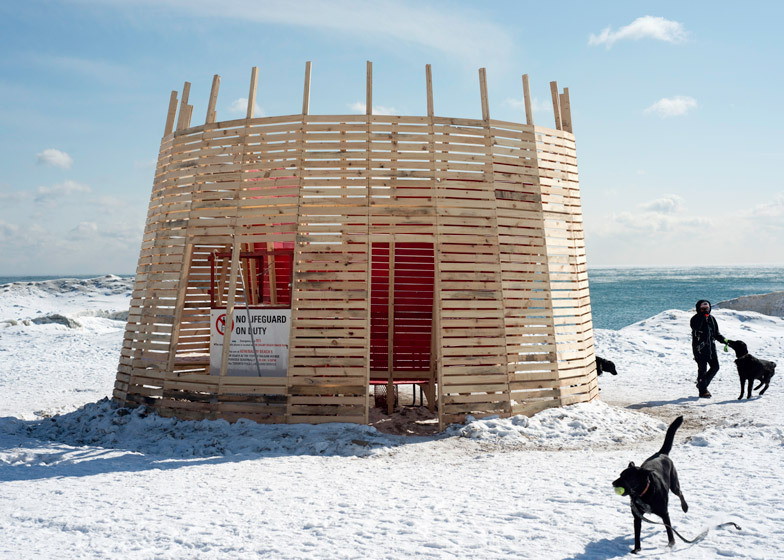 "The goal with winter stations is to infuse colour and vibrancy back into the beach community, which is so lively in the summer months, but tends to slow down come winter," added Roland Rom Colthoff of RAW. Loops of vivid red fabric were suspended from scaffolding erected around one watchtower to create Sling Swing, a reimagining of a deckchair by British designers WMB Studio. 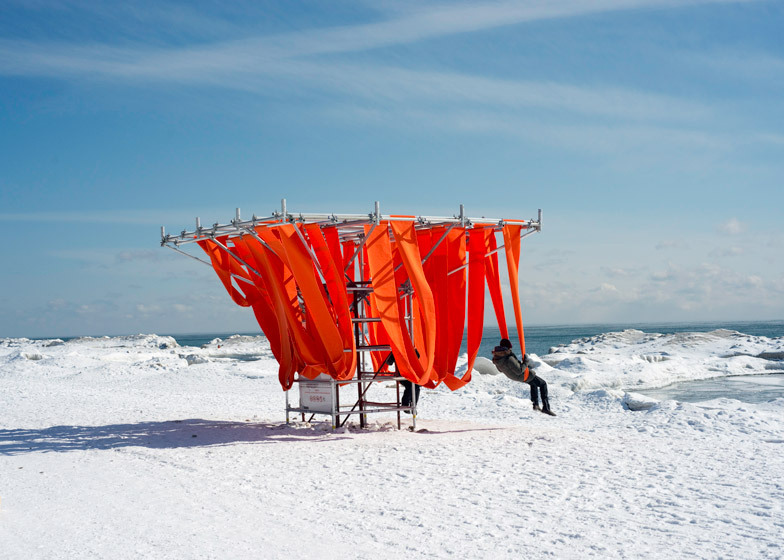 The fabric slings are intended to create cocoons of warmth for winter beach visitors, protecting them from the harsh winds. When unoccupied, the loops of material sway in the breeze. London designers DM_Studio used planks of pale timber to transform another lifeguard stand into a pointed form called Driftwood Throne. 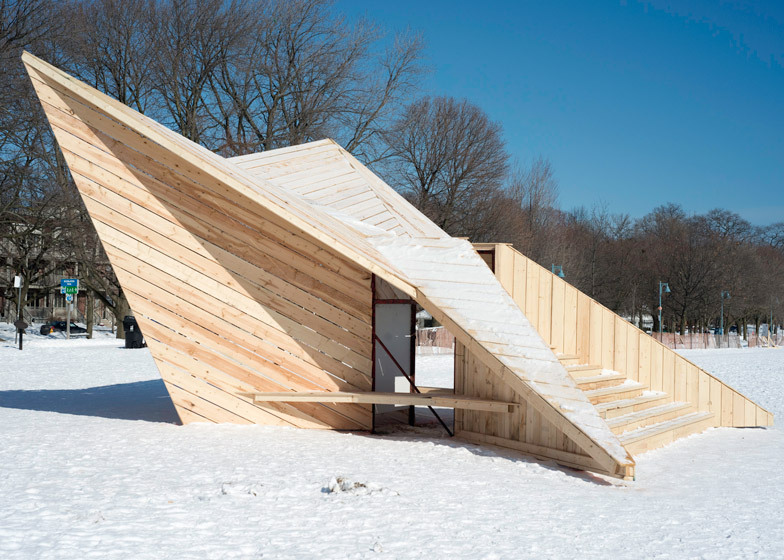 Wide steps lead up to an opening where a small bench forms a lookout point. 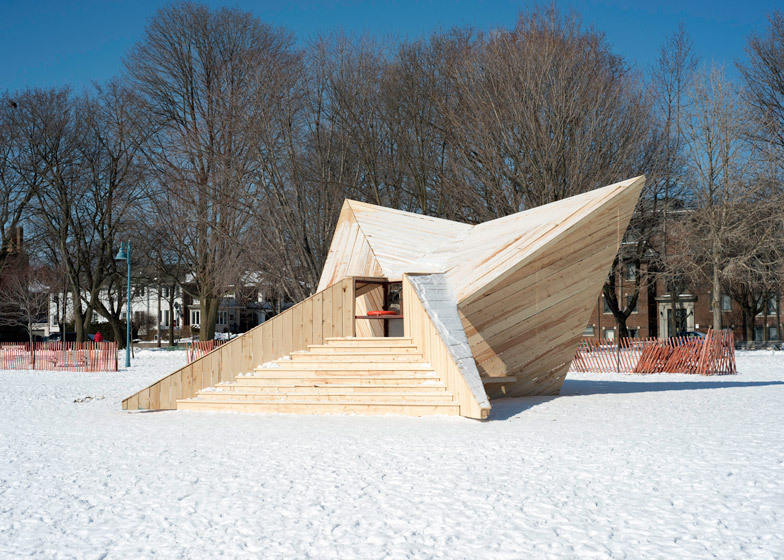 Ground-level benches recessed into nooks on either side of the structure are sheltered under the pointed wings of the structure. 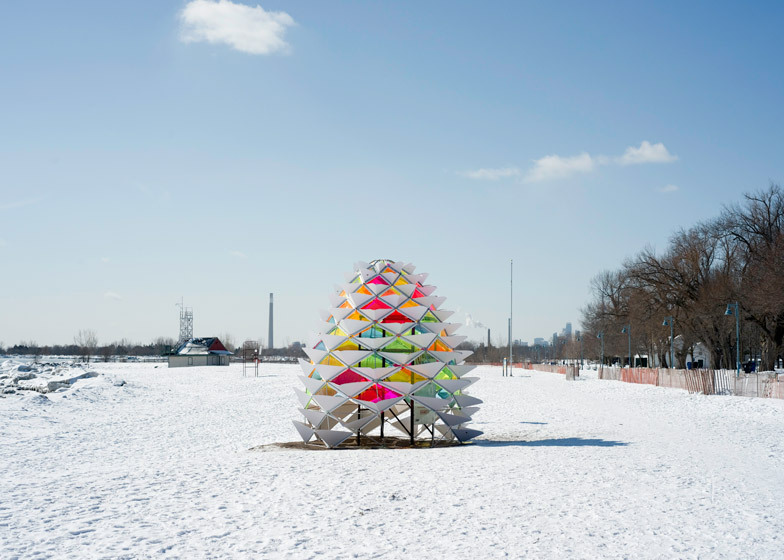 Diana Koncan and Lily Jeon, architecture and engineering students from nearby Ryerson University, produced Snowcone. 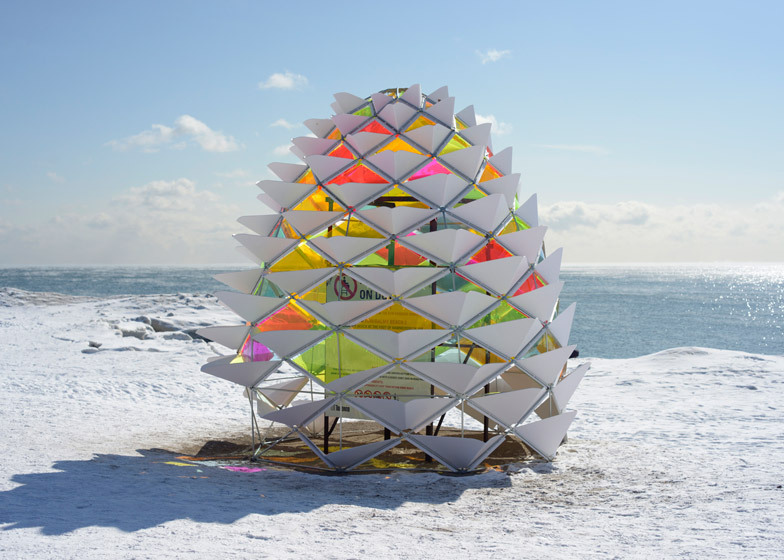 Shaped like a pine cone, the shelter comprises a metal frame and rainbow-coloured translucent skin. 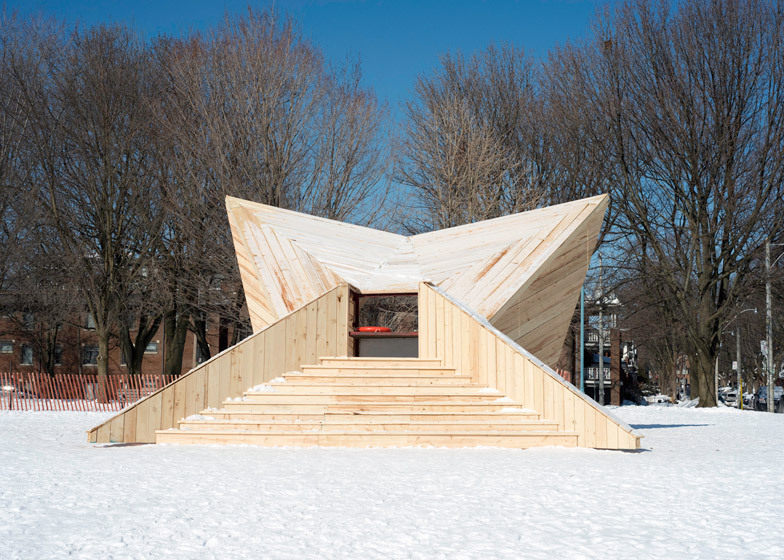 Triangular fins radiate from the exterior of the round structure, allowing it to catch snow. 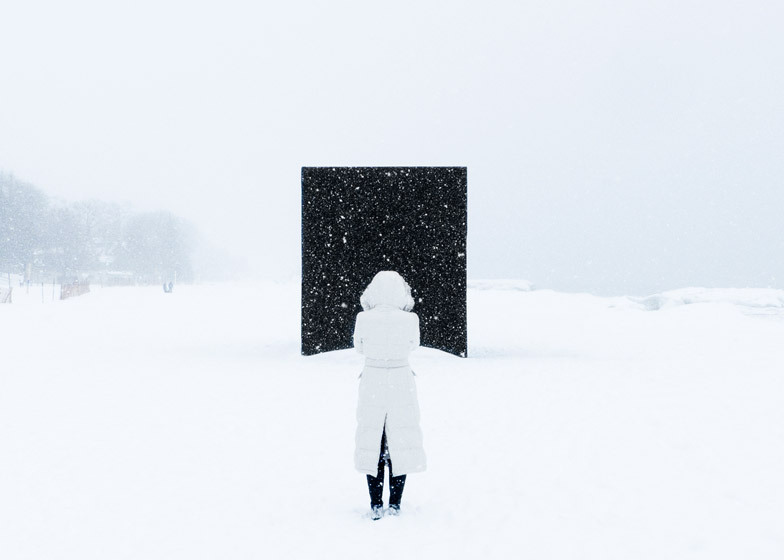 A cuboid called Hotbox is draped with black fabric and contains a cell with spongey walls, where visitors are insulated from the horizontal winds that are common in the area. 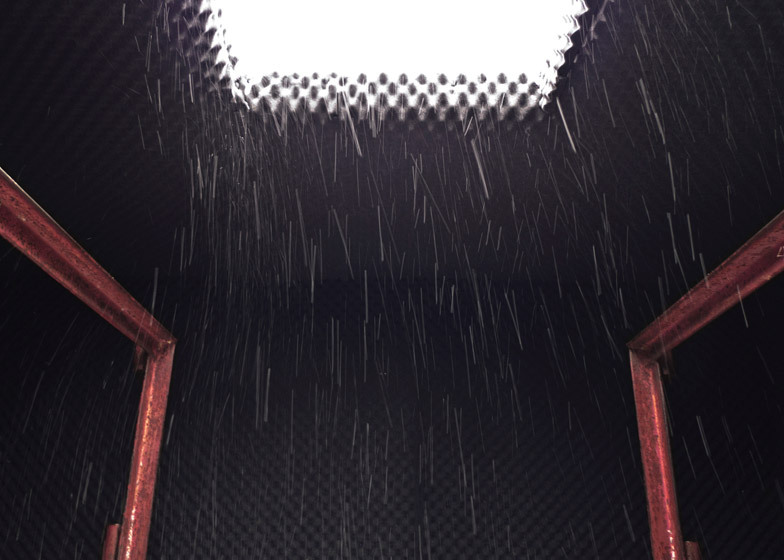 Created by Michaela MacLeod and Nicholas Croft, both based in Toronto, the shelter has a single hole in its roof that allows a small amount of daylight and precipitation into the interior. Taking cues from the classic wingback armchair, New Hampshire architect and designer Tim Olson produced Wing Back – a rounded fortress-like structure made from pale timber batons. 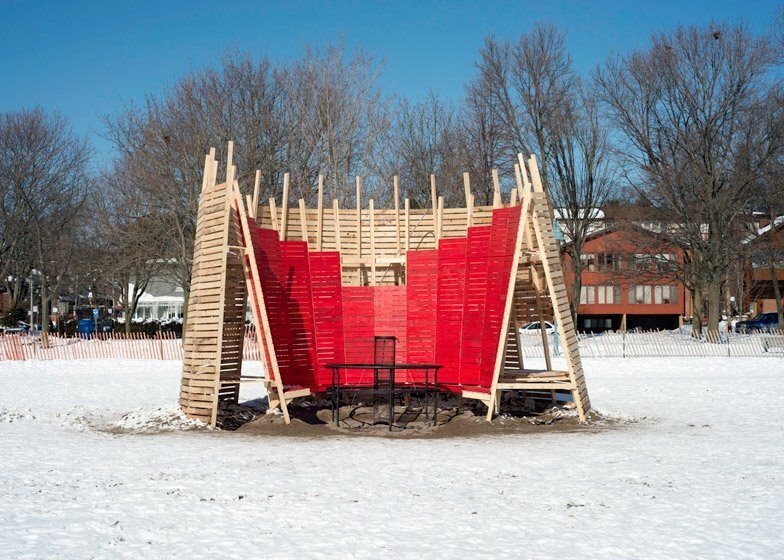 Inside the slats are stained bright red, acting as a beacon to encourage visitors to gather on a semi-circular bench around a fire within its tall, sheltering walls. 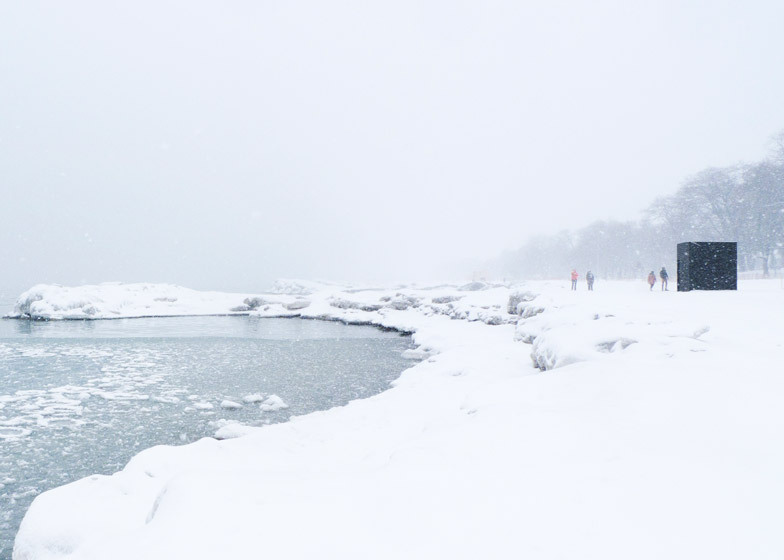 "Each installation establishes a relationship to the transformed, almost Arctic landscape with these massive ice formations and plays with the experience of being along the water, which takes on unique qualities and feelings this time of year," said Justin Ridgeway of Curio. The competition was supported by the City of Toronto and funded by a range of sponsors. 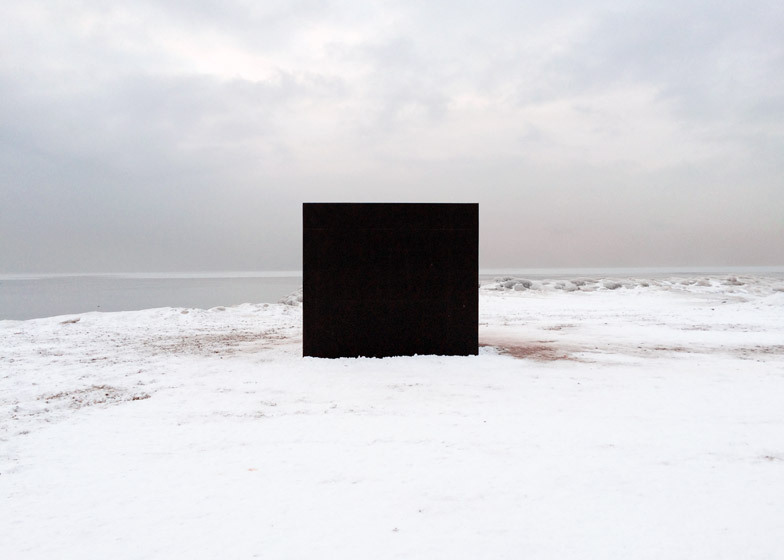 The five installations will be on show at Kew-Balmy Beach until 20 March. Partners: City of Toronto, the Beach Village BIA, Design Exchange and DeClute Real Estate Inc.